David A. Kyle's A Pictorial History of Science Fiction, unlike many so-called illustrated histories of various subjects, fully lives up to its name in both pictorial richness and historical detail. The Pictorial History is an oversized book, with hordes of illustrations in both black-and-white and color. Weird Tales was the forerunner of the regular sf magazine, having started in 1923, three years before Amazing Stories, but it never did surrender itself to the sf tide and remained primarily weird-fantasy for all its life. 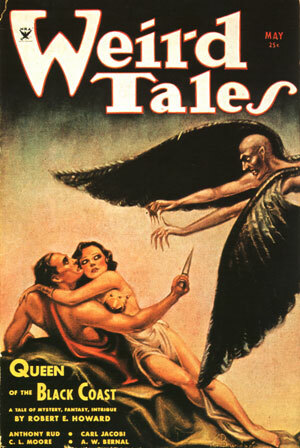 Nevertheless, Weird Tales, subtitled 'The Magazine of the Bizarre and Unusual', is part of the sf field, with its own unique role. This May 1934 issue is chosen because, not only is it an excellent example of Margaret Brundage's pastel artwork, it is also the first time Robert E. Howard's character, Conan the Barbarian, appears on the cover. Kyle's depth of knowledge of science fiction is tremendous. His approach here is basically chronological. He glances back to the beginnings in legend, Daedalus and Icarus and The Odyssey, surveying what he calls the Wood and Feather Millenniums of fantastic literature before we get to science fiction's immediate progenitors in the Iron Age of the 19th Century and the Steel Age which soars into the beginning of the 20th Century. Steel, steam, electricity transformed the human experience of the material world, and inevitably our sense of the future. The watershed was, as Kyle quotes Isaac Asimov, that "In the nineteenth century the future became the future of change and difference." Humanity, and we individually, still haven't adjusted to being on the other side of that watershed. 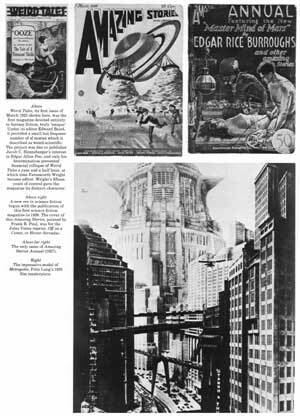 I believe, with the great editors Hugo Gernsback and John W. Campbell, that understanding the breadth of what the future may bring is vitally important to mankind's progression into that future. And the value of a history of science fiction, of writers and artists at play in that infinite realm? Walking back to the beginnings, turning and racing forward — that's how one takes a long-jump instead of a single step. What a range is shown and discussed here, what momentum and prospects still lie ahead. More obviously than ever before in human history, the future is being shaped by ideas consciously held. Science fiction has cast the net wide, to capture already so many shiny, glistening ideas. With this historical momentum, be sure and be glad that there are many dangerous and glorious ideas — and facts, and events — still out there. Mankind will encounter them, and the more imaginative education we have, the better. Space is deep. That said, David Kyle's A Pictorial History of Science Fiction is great fun! There is no typical page layout. Some pages have a single large illustration in color or black-and-white; a very few are all text; most have a combination of smaller illustrations, or text with a couple of illustrations. Kyle is quite readable; his text is history, not merely captions — captions are separate. Although the pictures are so interesting that it is difficult to refrain from leafing hither and yon through the book, letting one picture and then another fascinate the eye. In the course of his chronological survey, Kyle covers editors and publishers, writers and artists, the evolution of science fiction as a field. The once dominant magazines gradually giving way to paperbacks. Films from Metropolis to Forbidden Planet, as well as comics from Little Nemo in Slumberland to Superman, extend the field. Kyle looks at fans and fandom: small press publishers, fanzines, conventions — all of which help give science fiction its special culture and cohesion. A companion volume is David Kyle's The Illustrated Book of Science Fiction Ideas & Dreams, arranged thematically, and quite as good as this book. A widespread historical mistake which Kyle for excellent reason makes a point of correcting in both of his books, is the assumption that the August 1928 cover of Amazing Stories, with its famous Frank R. Paul illustration of a man wearing a flying belt, shows Buck Rogers. See Donald L. Franson's Amazing Stories, 1926-1995: An Obituary, with an Aside on Buck Rogers. A small but charming feature of each book is the author's dedication to a raft of science fiction and fantasy characters, ranging (in the Pictorial History's dedication) from Victor Frankenstein and Professor Challenger and Tom Swift and Arcot, Morey, and Wade and Jirel of Joiry to Galloway Gallegher and Jommy Cross and Lefty Feep and Hari Seldon and Lazarus Long ... I'll stop at ten. A great crew. I sure didn't recognize them all. There's an equal crew in the dedication to SF Ideas & Dreams. What depth of knowledge, and of affection; foretastes of the books. Both lists wrap up with acknowledgments to one or two of the real, key figures in 20th Century science fiction. A knowledgeable and thoughtful, wise and loving history.